Guide to Update Your Samsung Camera Firmware - Does your Samsung camera need firmware update? If that so, you don’t need to worry. Samsung is one of camera brand that release their firmware update regularly. Therefore, whenever you need to update your Samsung camera firmware, you will get what you want. Now, if this is your first time, here is the guide to update firmware for your Samsung camera. Connect your camera with charger or charge your Samsung camera until its battery become full. Format your SD card that you use in your camera. Of course, you need to backup all photo to your computer before you do this. Connect your Samsung camera to your computer. This will make your SD card in your camera appear in your computer as removable drive. Visit official Samsung support website and find the firmware that match with your camera model and series. Make sure you find right firmware and download it to your computer. The firmware update will come in ZIP file, so extract the content first. Copy the file from extracted ZIP file into your camera SD card. Because it appears as drive, you just need to drag or copy and paste it to it. Disconnect the USB cable that you use to connect your camera to your computer. Open your camera Menu, and then find Device Information option. Choose Firmware Update and select OK button. 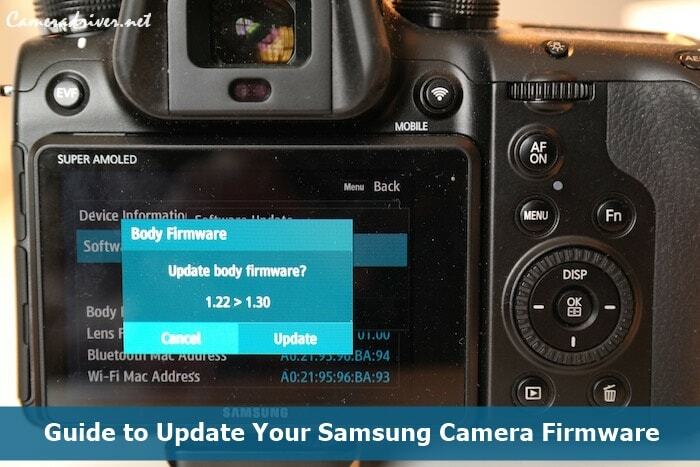 Lastly, choose Body Update and the camera will automatically update its firmware. Wait until it’s finished (you camera will reboot for few times). Once it finished, you can see that the firmware has been successfully updated. This Samsung camera firmware update is important, because it can fix the bug on your Samsung camera. Most common bug is the slow autofocus and some of Samsung camera doesn’t work with some SD cards. So, with this update, you can solve all of those problems. 0 Response to "Guide to Update Your Samsung Camera Firmware"